This Workstation offers practicality at a bargain price. Lots of functionality in a reasonably compact pedal; huge saving over separate units; only needs one power connection. There are no alternative routing possibilities; there's no 1962 and Katana combination. Keeley's Workstation range puts several of the company's effects into one pedal chassis, retaining individual switching but saving on pedalboard space while keeping leads and cables to a minimum. These 'multi-pedals' also represent a substantial saving over buying the pedals separately. The Tone Workstation has a bit of a back story. Keeley built a small batch of them about 10 years ago - giving them the status of collector's items these days, of course! But they came into the public eye again when John Mayer recently took two of the originals out on tour. 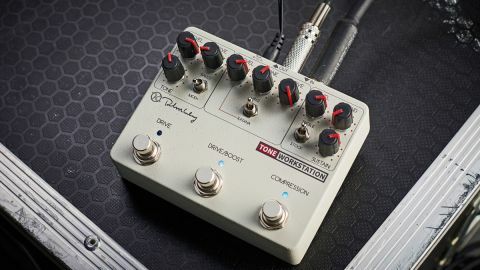 Consequently, Keeley has taken that original design and put it in a smaller pedalboard-friendly enclosure and re-engineered the design with a set of enhanced features. Basically, the design remit was to create a whole 'front end': a pedal to sit at the beginning of your signal chain and be the first stage in sculpting your sound. What we get here are the first three links in that chain. So you can have a compressor, a boost and an overdrive, or a compressor and two overdrives, depending on how you want to run it. The signal chain starts with a version of the respected Keeley compressor then runs into a section that can either voice the 1962 British amp-style overdrive or the Katana clean boost, and finally hits the Tube Screamer-styled Red Dirt overdrive. The compressor here is a variation on Keeley's two-knob compressor, but adds an all-important Blend knob for those who like a little more subtlety to their compression, keeping some attack rather than squashing the whole signal. Rolling the Blend knob anti-clockwise gradually takes you from a 50/50 parallel compression mix, to the full-on squash reminiscent of the MXR Dyna Comp and Ross compressors with consequent snappy chicken-picking note attack. There's loads onboard to allow a wide range of practical uses for the pedal. There's plenty to keep signal levels consistent or add sustain, which comes in extra handy if you're using the later overdrive stages. A treble switch adds or puts back sparkle and there's plenty of headroom, so you can use this as a clean boost with just a touch of compression. The 1962 overdrive is designed to emulate the sounds of a Marshall Bluesbreaker and delivers authentic mid-60s Brit crunch tones that can be backed off nicely with guitar volume, all focused with a Tone knob that concentrates on the area of stridency and presence. The alternative to using the 1962 is to flick the toggle switch for the Katana's JFET-based boost, dialled in with just the section's Level knob. With our Strat and clean Fender amp setup, we like the Katana in an 'always on' mode for an enhanced tone, but there's plenty extra to really drive an amp, and placed before the input to the Red Dirt, it can kick it up to make the difference when stepping from rhythm to lead. Robert Keeley is well known for his modification of Tube Screamer circuits and the Red Dirt is regarded as the culmination of that quest among Keeley's own pedals. What you are getting in Mod+ mode is the sound of a well-sorted TS808 with the pushed mid range, but with an extra tickle of clarity and really good response to player dynamics. 'Baked' mode ups the gain for more of a cranked amp distortion. Overall, there's loads onboard to allow a wide range of practical uses for the pedal. It may be that you'd just use the three sections at different times, but there are many useful combinations, too. Get those knobs carefully balanced against each other and you can set the pedal up to bring in progressively driven/ boosted stages of a core sound. There's also the opportunity with layering to create some tasty dirty tones. We have a thing for twin drive pedals - two levels of overdrive/distortion in one chassis is a great idea - but this takes that concept and runs with it. There are some compromises with this type of pedal, though: there's always the chance that you don't like one of the sections, or - perhaps more to the point - you know a pedal that you think can do the job better. Then, specifically with the Tone Workstation, there's the matter of effect order. A compressor first in the chain and a boost in front of an overdrive is the conventional wisdom, but some players might want to do it differently and, unfortunately, there are no internal DIP switches here to change that effect order, neither are there any extra inputs and outputs should you wish to do it with cables. However, we reckon the Tone Workstation setup will work fine for most players; anyone else always has the option to buy separate pedals. The salient point here, considering the Red Dirt alone costs £159, is that you're getting a huge cost saving over buying three (or four) separate Keeley pedals to do the job.